It can be surprisingly difficult to find a decent gent's bathing suit. Let's examine some contenders. Not a look to emulate. Board shorts have been the rage seemingly forever, yet they don't really fit the bill. Don't get me wrong: Board shorts are great for working-out and surfing, but they aren't particularly good for swimming. They are far too loose and baggy for even a short swim. And their image as the swim suit of choice for frat boys on vacation doesn't speak in their favor. The traditional American option of a volley-style short with elastic waistband and built-in liner doesn't work either. For one, no one really looks good wearing something with an elastic waistband. Also, this type of swimwear has an annoying tendency to balloon in the water in a very unflattering way. Competition briefs (erroneously called Speedos by many) are best for just that: competition. Jammers look too much like the bike shorts popular in the '80s. 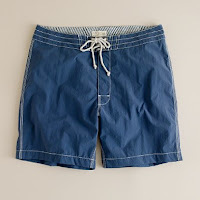 There are some companies making men's swimwear in a more traditional vein, such as Parke and Ronen or Baron Wells. The Baron Wells sea pant is quite nice looking, but is rather pricey. Another option is the square cut or "budgie smuggler" style famously worn by Daniel Craig in Casino Royale. These are perhaps the most classic of all men's swimwear styles, but one must have the right physique to pull it off. Speedo makes some very nice square cuts, especially the ones made for the European market. If you are in good enough shape, these are a great choice, and are perfect for actual swimming. My choice? For some time I was a big fan of J. 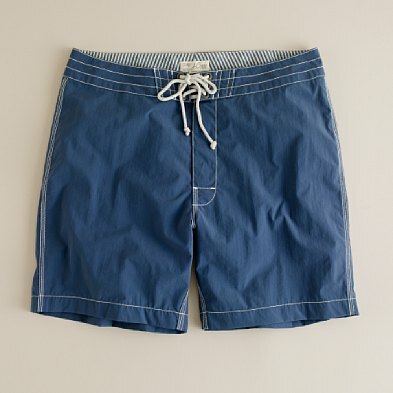 Crew's short, vintage-style board shorts. They are nothing like the oversized, overlong board shorts one finds in a surf shop. The fit is nicely snug without being tight, there is no unsightly elastic, and the leg length is good. I can go on a nice ocean swim without feeling unnecessary drag, and walk along the beach without feeling indecent. 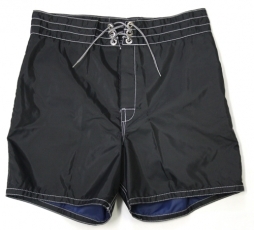 All in all, a good men's swimsuit with a classic, traditional appeal. These were my go-to shorts until I went to a thrift store and found a couple of pairs of Birdwell Beach Britches 301s in my size. For the unaware, Birdwells are old-fashioned board shorts. 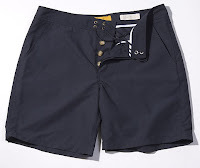 They are to swimwear what Levis 501s are to jeans or Brooks Brothers shirts are to dress shirts, and have been written about in Men's Journal, Uncrate, and the New York Times. I particularly like Uncrate's description of the Birdwell 301s having "simple styling that would look totally natural next to 007's 1964 Aston Martin." Normally 301s are at least $60 each. I picked up two pair-—one black, one sort of peach colored-—for under $6. Very comfortable; much shorter than today's trendy board shorts, and more fitted, too. They dry incredibly fast. Another plus: Not only are Birdwells known for durability, they are still made in the USA.